New. Jack Reacher is strolling nowhere in a Chicago street when he spots an attractive young woman struggling on crutches. He stops to offer her a steadying arm. And then he turns around to see a handgun aimed straight at his stomach. Locked in a dark, stifling van racing across America, chained to the woman, Reacher needs to know why he's there. Series: Jack Reacher Novel. Num Pages: 548 pages. BIC Classification: FF; FH. Category: (G) General (US: Trade). Dimension: 179 x 107 x 35. Weight in Grams: 288. 1999. Paperback.....We ship daily from our Bookshop. New. 2010. Paperback. Jack Reacher, alone, strolling nowhere. A Chicago street in bright sunshine. A young woman, struggling on crutches. He offers her a steadying arm. And turns to see a handgun aimed at his stomach. Chained in a dark van racing across America, Reacher doesn't know why they've been kidnapped. The woman claims to be FBI. She's certainly tough enough. Series: Jack Reacher. Num Pages: 560 pages. BIC Classification: FH. Category: (G) General (US: Trade). Dimension: 198 x 127 x 34. Weight in Grams: 388......We ship daily from our Bookshop. Enjoyed this book. Another great Jack Reacher story. Haven't read it yet, but I enjoyed the first one quite a bit so I'm assuming this will be another 5 star read. Became interested after the movie this past Christmas (Tom Cruse as Jack Reacher). Reading all the books now. Each one exposes a little more of Reacher's background, characteristics, talents, motivation, circle of friends etc.. No bad Reacher books! 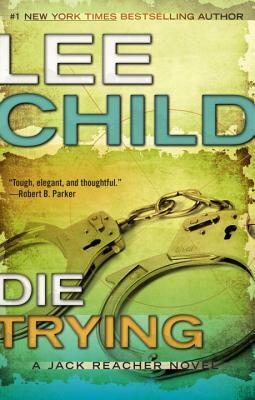 Another good Jack Reacher adventure by Lee Child. I plan to read every one. Jack Reacher helps a woman with a cain as she's having difficulty putting her dry cleaning into her car. Three men approach with guns drawn, they abduct the woman and take Reacher also. They carry the prisoners to their enclave in Montana where they have a community of people who have certain intentions against the govenrment. The woman, FBI agent, Holly Johnson, is meant to be a bargaining chip with the government. Reacher shows his many talents in this second installment of his stories. He's intelligent and highly analytical. He seems to be able to forsee what the men are planning before they act. He is also the lone man against seemingly insurmountable odds. He also shows his human side and develops a fondness for Holly. His compassion and strength are two of the reasons why readers enjoy Reacher as a character and sympathise with his actions. The story had lots of action and the plot was logically laid out. The author provided a few twists and surprises that made it even more of a fun read. This was the second time I have read this novel and enjoyed it once again.